With the theme Image and Sound of Fragrance, popular multi-disciplinary arts festival ARTWALK Little India (ARTWALK) returns for a grand celebration of the cultural precinct’s rich heritage via the arts. Visitors can look forward to new highlights including an immersive exhibition at UltraSuperNew Gallery, five more murals to add to Little India’s colourful vibrancy, and an extended programming over 16 days, the festival’s longest period yet. The exhibition at UltraSuperNew Gallery, a first for ARTWALK, features works by acclaimed artists Tan Ngiap Heng, Bani Haykal and more. Curated by Cultural Medallion winner and LASALLE’s Senior Fellow Milenko Prvacki, the artists will collectively transform smell into a visual soundscape for a truly multisensorial experience. 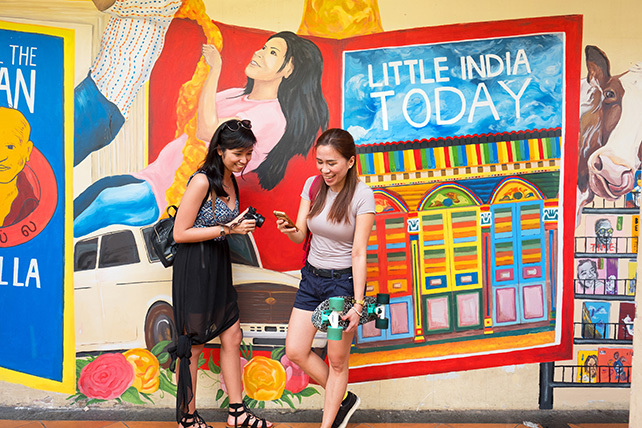 Also making first-time appearances are young artists SONG, who will unveil an ambitious wall mural that captures all the sights and smells of the neighbourhood, and Susanna Tan, who encapsulates her well-wishes for the Singapore Indian Fine Arts Society in a mural along Starlight Road. Theatre fans can enjoy a re-telling of Kuo Pao Kun’s The Coffin is Too Big for the Hole by students from LASALLE’s Diploma in Performance programme. This rendition of one of Singapore’s most famous classic plays, as conveyed by a young Indian woman in modern day society, was staged in France’s Limoges Festival in 2018 where it received praise for its inventiveness and stagecraft. Since its inception in 2015, ARTWALK has been a staple feature of Singapore Art Week, and is jointly organised by LASALLE College of the Arts (LASALLE) and Singapore Tourism Board (STB), with the support of Little India Shopkeepers and Heritage Association. From a visitorship of 74,000 in 2015’s inaugural edition of ARTWALK, the festival has grown by leaps and bounds, attracting over 260,000 visitors in 2018. Year-on-year engagement has seen many artists and partners continuing their collaboration with the festival. Well-loved festival highlights returning in 2019 include master storyteller Kamini Ramachandran, who is back to breathe life into back-alley whispers from Rowell Road, while artists ZERO and Shah Rizzal add their unique signature to the walls of the district once more. Main sponsor Tekka Place and co-sponsor Nippon Paint have also renewed their commitment to support the neighbourhood, while Monster Day Tours, SIFAS, Mural Lingo and the Indian Heritage Centre present a host of specially created programmes. Adding to the multi-sensory experience are various exciting fringe activities – visitors can make their own bath salts in a spice workshop, or try their hand at creating music with a two-headed mridangam drum.